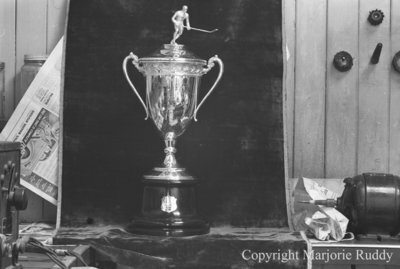 A black and white negative of the Jack King Memorial Cup taken on March 23, 1938 in Whitby, Ontario. The Jack King Memorial Cup was presented to the championship team in the Whitby Lions Club Midget Hockey League. The Jack King Memorial Cup was presented by Mundy Goodfellow Printing Company and the Whitby Gazette and Chronicle. Jack King Memorial Cup, March 23, 1938, Marjorie Ruddy. Whitby Archives A2013_040_972C.